Published: Aug. 22, 2013 at 06:28 p.m. Updated: Aug. 23, 2013 at 03:37 p.m.
Operation Patience now is Operation Paycheck. 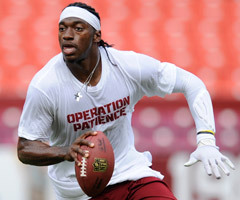 Washington Redskins quarterback Robert Griffin III was fined $10,000 by the NFL for wearing unauthorized apparel, a league spokesman confirmed to NFL.com and NFL Network on Thursday. The Washington Post first reported the news. Griffin wore unauthorized apparel emblazoned with the phrase "Operation Patience" during pregame warmups before Monday night's game against the Pittsburgh Steelers. That was RGIII's catchphrase for working his way back into full-time duties after offseason knee surgery. The best part about Operation Patience is that it's almost over. All signs still indicate Griffin will start in the Redskins' season opener against Michael Vick and the Philadelphia Eagles. UPDATE: Griffin addressed the fine at the Redskins' Welcome Home Luncheon on Friday, per The Associated Press, joking: "Those auctioneers did a good job. I would've given them 10 grand, but the NFL took it away from me this week."